This small 3 Piece Nativity is beautiful and brightly colored. Comes with Joseph, Mary and Baby Jesus. 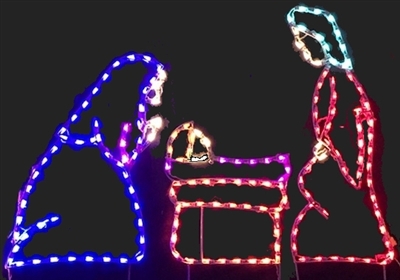 Joseph measures 42"T x 15"W, Mary measures 36"T x 20"W and Baby Jesus measures 18"T x 25"W (including ground stakes) comes with LED M5 Mini Lights attached to frame.